St. Paul, Minn. — One thing I truly love about Christmas is that it's celebrated around the world. That's one reason I've been glued to this new holiday recording featuring the a cappella Norwegian chamber choir Grex Vocalis. Not only do they feature five different composers' treatments of the beautiful opening text, "O Magnum Mysterium", from the midnight Christmas Mass, they also take us on a trip throughout Europe with hymns and carols from Norway, France, and England. Grex Vocalis is directed by Carl Høgset who coaches singers and conductors in Norway and abroad. Hogset founded Grex Vocalis, which means "The Singing Flock," in 1971. Since then the group has become renowned for its smooth, even sound, a well-balanced combination of timbre and sparkling overtones. To create a unified choral sound, the conductor methodically works on tuning each chord and forming each vowel. As a singer, I know how difficult it is to shape a phrase when singing a line, but this ensemble has it mastered. Take a familiar carol like "Silent Night" and you'll hear what I mean, right away. Grex Vocalis not only builds a phrase into a luscious crescendo, they carry it over into the next musical phrase or idea. With the singers' impressive breath control, it seems like a continous flow of sound. Much of the Christmas season is founded on a sense of wonder, a wonder that the original shepherds and wise men of biblical times must have felt as they viewed the newborn baby Jesus lying in a manager. The text that shares that great mystery is found in the "O Magnum Mysterium" pieces on this recording, represented here by two Renaissance and three 20th-century composers. Morten Lauridsen has emerged as one of America's finest and most beloved composers. A longtime faculty member at the University of Southern California, he wrote "O Magnum Mysterium" in 1994 for the Los Angeles Master Chorale. Since its premiere, the piece has had literally thousands of performances worldwide. You might say it's one of his "greatest hits," which is a bit ironic in that Lauridsen refers to this piece as "a quiet song of profound inner joy." When I hear this piece, I can't help but pause and be amazed at the world around me. While Lauridsen's "O Magnum Mysterium" is more contemplative and filled with inner joy, Tomas Luis de Victoria's "O Magnum Mysterium" is more extroverted. Victoria was the best-known Spanish composer of the Renaissance. It's thought that he probably studied in Rome with Giovanni Palestrina, the music master at the Roman Seminary. Palestrina, who is also represented on this recording, had two sons about the same age as Victoria, so he became something of a father figure to the young composer. Victoria's setting opens with quiet meditation, but he doesn't hesitate to express his joy about the newborn king. It comes bursting through in the final Alleluia. In case you were wondering, this Norwegian chamber choir doesn't forget its number-one son, Edvard Grieg. Grieg wrote a poetic melody to accompany the text, "O Green and Glittering Tree." I suppose you could say it's the Norwegian equivalent of "O Christmas Tree", but this one is rarely heard. Plus, there's a gorgeous tenor solo featuring Magnus Staveland. His voice is rich with a timbre that sounds much darker than the average tenor. Overall, this recording gives us the opportunity to pause for a few moments of quiet reflection during this busy time of year. There are however, a few high energy moments, too. Their reading of the French carol "Il est né,le divin Enfant," will definitely lift your spirits. This is a special cd, with a wide range of moods and styles. 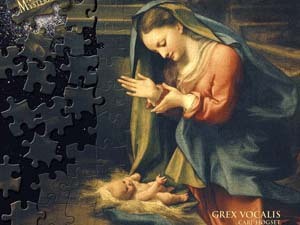 If you're looking for a special theme album this season, this one by Grex Vocalis should be on your list.